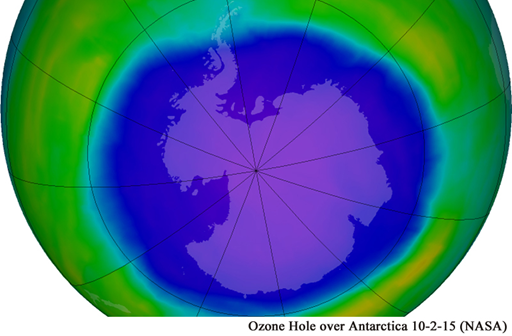 Another year has passed and that stubborn Ozone Hole over Antarctica refuses to go away. Data from the National Aeronautics and Space Administration (NASA) shows that the Ozone Hole for the fall maximum season grew 22 percent from 2014 to 2015. World consumption of Ozone Depleting Substances has been reduced to zero over the last three decades, but the Ozone Hole is as large as ever. Did humans really save the ozone layer? In 1974, Dr. Mario Molina and Dr. Sherwood Roland of the University of California published a paper asserting that chlorofluorocarbon (CFC) pollution from industry was destroying the ozone layer in Earth’s stratosphere. CFCs were gases used in hair spray, refrigerators, and insulating foams. The ozone layer is a layer of atmosphere located between 6 and 25 miles above the Earth’s surface. 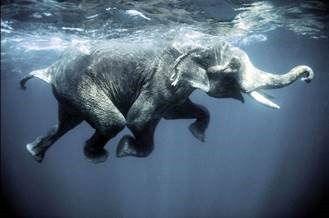 In my last two articles I examined what we know, but more importantly what we don’t know, about the three main greenhouse gases (GHG). The first examined methane (CH4) and the second CO2. The fluster of responses about data and accuracy of measurements is essentially irrelevant because combined CH4 and CO2 represent only four percent of the GHG. It didn’t matter whether Beck was right or wrong about actual CO2 measures, what was important was the degree of variability the data showed, such as with the stomata data. This variability was deliberately eliminated in other measures to achieve a smooth, with no splinters, ‘hockey stick’ because it contradicted the well-mixed scenario essential to the Anthropogenic Global Warming (AGW) agenda. In my earlier post, I worked out the total cost of onshore wind, based on a capacity factor of 26%, which is all that is being achieved in the UK according to DECC. For every MWh produced by onshore wind, there is an avoided cost of not having to generate by another source. For this scenario, let us assume it is gas fired generation which is avoided. (If we compare to coal or nuclear, the avoided costs are much lower still). The saving from this will be the variable cost of $57.80/MWh. (This does not take account of the likelihood of extra costs incurred from switching the gas turbines on and off). In other words, we have to pay $97.64/MWh for wind output, but only save $57.80. Clearly, in any sane world, this would be regarded as a no brainer. The state imposes a rule based on phony science on all U.S. truckers. The Environmental Protection Agency and California Air Resources Board (CARB) are riding high after exposing Volkswagen ’s emission scam. But the self-proclaimed guardians are running their own regulatory racket. See their shakedown of Virginia-based trucker Estes Express Lines. Under the Clean Air Act, the Golden State enjoys unique authority to impose stricter emission standards than the EPA, but only within its sovereign borders. Yet CARB exported its vehicle emission standards nationwide by forcing auto makers to re-engineer their fleets to state rules. Now the agency is trying to bring out-of-state truckers to heel. In 2008 CARB banned diesel engines manufactured before 2010 from California roads. Under the rule, over a million truckers who operate in California, including 625,000 registered out of state, are required to replace their engines with a newer model or install a diesel particulate filter, which can cost more than their vehicles are worth. This month CARB and EPA announced a $390,000 settlement with Estes—$100,000 of which goes to the U.S. Treasury—for failing to install filters on 73 of 500 trucks it operated in California between 2012 and 2014. Estes has since upgraded its entire California fleet. CARB doesn’t have authority to subpoena documents from out-of-state businesses, so EPA assisted the investigation by asserting jurisdiction under California’s 2012 State Implementation Plan of the Clean Air Act that includes the truck rule. Last year EPA demanded that a dozen interstate trucking companies show compliance with California’s rule. A CARB spokesperson says the prosecution is “the first of what we hope are many cases.” Caveat trucker. Not surprisingly, the green police claim they are protecting Californians. According to EPA, the truck rule will prevent 3,500 premature deaths between 2010 and 2025. Yet there’s little evidence linking diesel particulate matter with an increase in mortality in California, which has among the lowest age-adjusted death rates in the country. Studies show a weak association between mortality and particulate matter in Appalachia and the Midwest, but virtually no correlation in the western United States. This may be because the chemical composition of particulate matter—which can be generated from dust, wildfires, pollen, power plants, mining and farming—varies by region. Diesel exhaust makes up a small fraction of these fine airborne particles. Notably, the epidemiological study that CARB used to justify its truck rule in 2008 had to be corrected after it was revealed that the report’s lead staff scientist had purchased his statistics doctorate for $1,000 from a diploma mill. CARB later revised its estimates of premature deaths prevented by the rule down to 3,500 from 9,400. After discovering the deceit, CARB Chairwoman Mary Nichols failed to inform the board and went ahead and propounded the regulations for adoption. In other words, the regulations under which EPA and CARB are prosecuting truckers are based on dubious science. But when the cause is green virtue, such details don’t matter. His report runs to thirteen pages, well worth a read. But some of his tables and charts tell the story. The home secretary has criticized the lack of ethnic diversity in police forces and dismissed “untrue” claims made by Met Commissioner Sir Bernard Hogan Howe that the rise in knife crime is linked to the reining in of stop-and-search powers. She also challenged Hogan-Howe for saying the rise in knife crime in London is linked to a reduction in stop-and-search. Last week, he said the Met Police have been forced to increase the use of stop-and-search in 18 London boroughs due to rising recorded knife crimes. yep that’s the way to help integration, just insult/discriminate the whole native ‘white’ population. Obviously that is not going to anger anybody and will make those ‘white’ people accept the new status quo. Way to go.